With over 40 years in the plumbing industry, Endeavor Plumbing is the top provider of plumbing services in Ashburton. Plumbing is linked to appliances and every-day necessities, and any malfunction in the system can present major inconveniences that could often worsen if not repaired or examined by professionals. Our team at Endeavor Plumbing has a vast amount of years of experience, making us more than suitable to handle any kind of task. We do not segment our work to one one specific type of client, instead we operate with a broad range including customers such as businesses, residence owners, real estate agents, and many more. Depending on the job at hand, we will select the best fitting tools to fit your plumbing system’s needs. Services To Help You With All. Beyond the standard plumbing services, we provide assistance with gas water heaters, blocked drains, general maintenance, renovations, among many others. Often our clients will find that emergencies in their systems will occur at unexpected times; for this reason, our team works around the clock, and they are ready to respond to your needs immediately. One of the reasons why we continue to be one of the most successful plumbing businesses in Melbourne is due to our emphasis on the importance of customer care. You can rest assured that as our customer, your expectations will be our priority from start to finish. Our work will show results that will guarantee your satisfaction. We approach all tasks with utmost professionalism, fully communicating all steps of the job required to our clients and making sure they are well informed. Lastly, the pricing for our work is affordable and does not in any way impact the calibre of our work ethic. If you are in need of Plumbing services in the Ashburton area, contact us through our website or give us a call. One of our plumbing professionals will be sure to assist you. If you live in the Ashburton area and require plumbing services, contact us through our Contact page, or via telephone. We will respond to your requests as soon as we can. The map below shows the service areas Endeavour plumbing offers in Ashburton, Victoria. For emergency plumbing services in the below service area in Ashburton, call us. We also provide plumbing services in Metro and surrounding suburbs such as our plumbing services in Caulfield, if you're looking for the quickest service speak to our expert plumbers today. 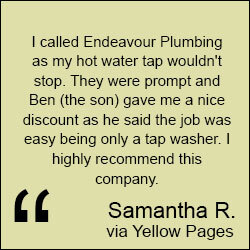 Endeavour Plumbing on Google Plus | Follow Endeavour Plumbing on Facebook | Plumbing Service Areas | Contact Us All Rights Reserved (c) Endeavour Plumbing Melbourne.